Experience the rugged beauty of remote Milford Sound from Wanaka, all in half-a-day. 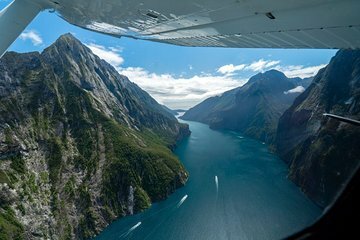 With a choice of morning or afternoon flight departures, fly over lush national parks, epic glaciers, and alpine lakes, before touching down in the Sound. Enjoy a scenic cruise, keeping an eye out for some of the local inhabitants including seals, penguins, and dolphins, before returning to Wanaka by plane.